The lost resting place of British poet and artist William Blake was finally marked Sunday with a gravestone, almost 200 years after he died. Despite his influence today, Blake died in obscurity in 1827 and was buried in an unmarked common grave in Bunhill Fields, a London cemetery. Only a plain memorial stone recorded that he was buried nearby, much to the dismay of two devotees who visited, and who decided to find his exact resting place. Luis and Carol Garrido had as their guide the original coordinates of his burial, which were based on a grid of graves but became confused when parts of the cemetery were converted into gardens. After two years of research and some painstaking work with a tape measure, they found it, and the Blake Society -- of which they were members -- began fundraising for a new memorial to mark the spot. The society raised US$38,300 through donations from around the world, as well as a benefit gala. 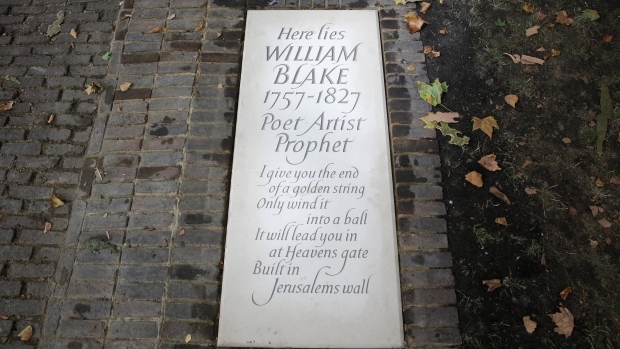 The engraved slab of Portland Stone unveiled on Sunday reads: "Here lies William Blake, 1757-1827, Poet Artist Prophet", followed by two lines of his verse. 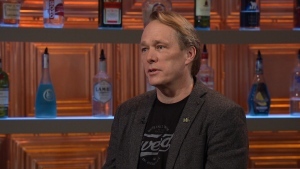 "It matters that we recognize those who have contributed to our cultural heritage, and no creative genius has influenced people to the extraordinary extent as William Blake," Nick Duncan, a trustee of the Blake Society, said in a press release. "Yet almost two centuries after his death, Blake's grave is unmarked. People walk unknowingly over it, dropping litter and thinking of other things." He added: "At last lovers of Blake from all over the world will have a point of pilgrimage."